In keeping with the essay I wrote about cooking with a sense of place, I have modified a friend’s recipe by anchoring it in a Northern, cold-climate tradition. This is a lovely wild rice salad I first found in Maria Speck’s excellent cookbook Simply Ancient Grains. I am a sucker for offbeat grains, and especially wild rice. I have a thing about wild rice. Real wild rice. Mahnomen. If you’ve only ever bought wild rice from Uncle Ben’s or somesuch in a regular supermarket, know that you’re buying cultivated “wild” rice likely grown in California. Not that cultivated “wild” rice isn’t fine, but it simply doesn’t compare to the real deal. 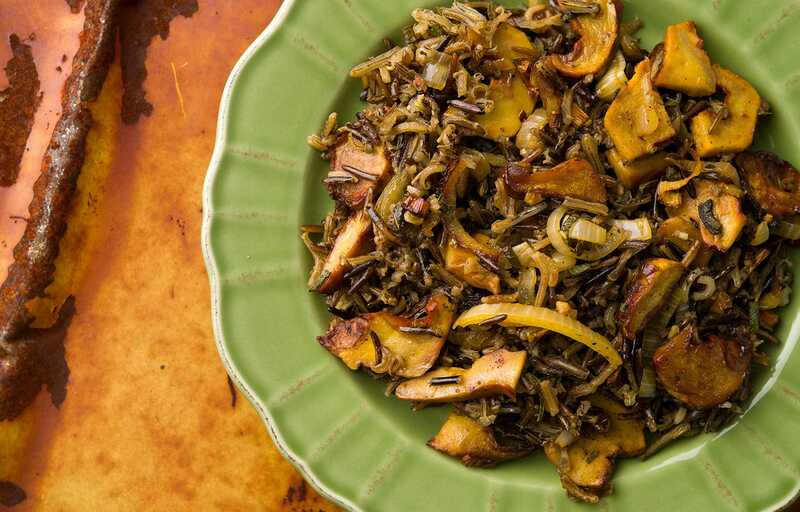 Real wild rice is, well, wild. It’s gathered, not grown. The grains of Zizania palustris are longer, more irregular, and lighter in color than the inky black stuff you get in the supermarket. It’s also parched over fire, which lends a subtle smoky flavor to it. Oh, and did I mention that real wild rice cooks in less than half the time as cultivated? Why I have no idea. How do you get it? Have a friend like Sam Thayer send you some. Or go to a gas station in the Upper Midwest, where I’ve seen it next to the smoked fish in places like Michigan’s Upper Peninsula or northern Wisconsin. Or, you can buy it online. And of course you can make this wild rice salad with regular wild rice, too. Maria is part Greek and part German, and her recipe reflects that bifurcated heritage. My take on it is deeply Northern. She uses olive oil. I use an oil more suited to wild rice: Unrefined canola oil, which is to the refined crap what a troll is to a supermodel. Golden, beautiful, grassy and bold. Wonderful stuff. Any decent nut oil or unrefined sunflower oil would be other good choices. I also use wild mushrooms, because, well, I can. Finally, I chose to use homemade walnut ketchup in place of Maria’s soy sauce and balsamic vinegar. It works really well. I realize you probably don’t have any walnut ketchup kicking around, but Worcestershire sauce will get you close. What’s the net effect? Really, really savory. Balanced with the tart walnut ketchup (or balsamic or Worcestershire), meaty from the mushrooms and pleasantly chewy with the wild rice. If you wanted to make things pop even more, add a handful of cranberries, tart wild blueberries or lingonberries right at the end. This is a worthy vegetarian dinner, but I designed it as a side dish for simply cooked duck breasts or venison backstrap. Either way, it’s just damn good. For this wild rice salad, I used wild lobster mushrooms here, as well as real-deal wild rice from Canada. 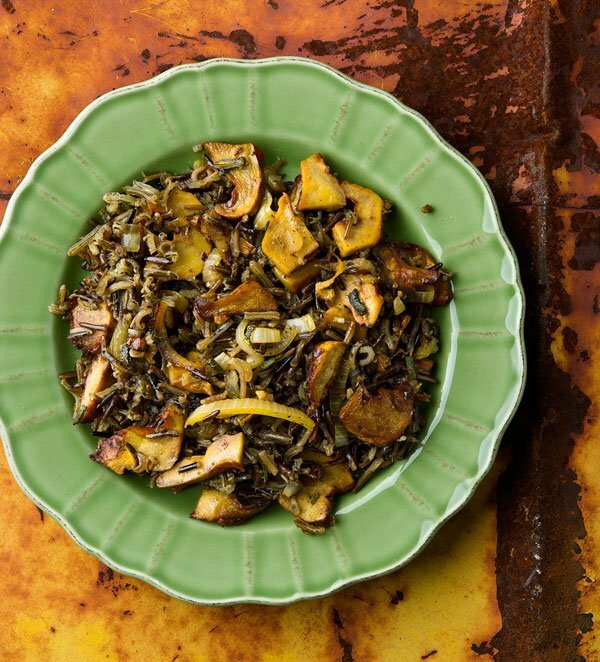 Both are available online, but you can make this with any sort of wild rice or fresh mushrooms. You can also use Mediterranean touches like olive oil and balsamic vinegar if you'd rather. 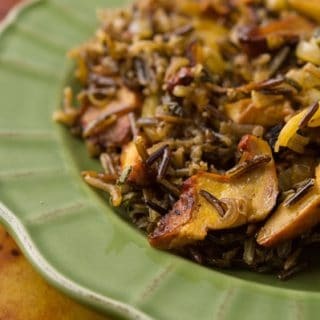 Put the wild rice, broth, rosemary or spruce needles, and a healthy pinch of salt into a small pot and bring to a boil. When it boils, drop the heat back to a simmer and cook until the wild rice is tender, between 25 minutes and 50 minutes, depending on whether you have truly wild or cultivated wild rice. Drain and set aside. While the rice is cooking, preheat the oven to 425°F. Slice the mushrooms into largish pieces you'd want to eat. Toss the mushrooms with the onion, half the sage and a little of the oil. Arrange in 1 layer on a baking sheet and salt well. Roast in the oven until the mushrooms are browning, about 20 minutes. If the mushrooms are done before the rice, move everything to the center of the baking sheet and cover with foil. Turn off the oven and set inside until the rice is done. To serve, mix everything but the cheese in a bowl and season with salt, black pepper and the oil and walnut ketchup or Worcestershire sauce. Grate the cheese on top and serve at once. 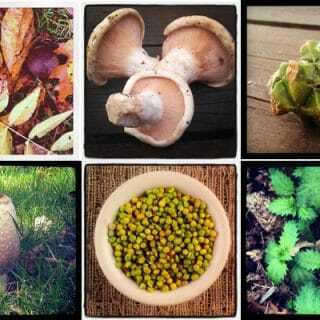 Explore the whole world of wild foods, from wild rice to wild mushrooms, greens and nuts here on Hunter Angler Gardener Cook. I thought I’d share my wild rice source – it’s the Bois Forte Band of Chippewa. Their wild rice is delicious; you can read all about it on their website here: http://www.nettlakewildrice.com/ If you want the REAL deal, try a bag of their hand-parched rice – truly a special treat! Wow, thanks Pete! Will check them out. Best source is harvesting it yourself on a lake in N. Minnesota! Labor intensive and deeply satisfying. Do you have a source of unrefined canola oil to recommend? The best I’ve had was one raised and pressed locally near St. Andrews, Scotland. Not available here!